Installment Plan for the SOQI Bed Sauna. The SOQI Bed Sauna Spa is available through an installment plan - x1 down-payment, plus x5 monthly payments and no interest. Ideal for any health business - spas, health clubs, health clinics, business office corporations for staff and executives etc - as well as for home use. A tax right-off for business owners. Total Health Spa for Home or Business. Only available within the USA. Holistic Healing, Relaxation and Rejuvenation. 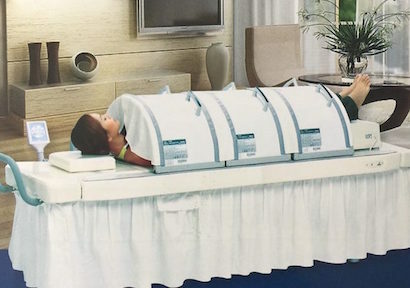 The SOQI Sauna Bed is an extraordinary healing tool for all ages. Advanced Japanese technology for the entire family, or for clients. Far Infrared heat therapy combined with passive aerobic exercise. Multiple health benefits. Built in MP3 player for additional music therapy. SOQI Spa's offering holistic therapy sessions to the public, may be found across Asia, Canada, Australia and Europe, with many now being set up in the USA. Everyone tends to fall in love with this extremely relaxing, intense Far Infrared therapy that combines with the original Chi Machine for full body health, healing and wellness. + Sales Tax and Shipping. Download, fill out form, then email to head office. 1) If you decide to purchase the SOQI Bed, we suggest you sign up as a new distributor for $30.00, and instantly earn a commission check, thus lowering the total cost of the SOQI Bed. 2) The SOQI Bed Sauna Installment Plan is currently only available in mainland USA - Hawaii, Alaska and Puerto Rico excluded. 24hr Hotline - Any questions, anytime. Serious healing from the inside out. How healthy and happy is the energy in your life?